When buying or selling a home, one of the most important documents you will have is the Agreement of Purchase and Sale, also commonly referred to as the “Offer”. This legally binding contract will outline in detail everything from the purchase price, closing arrangements and conditions to titles and chattels. It is always best to have a lawyer go through the details of every document or contract you have to sign when buying or selling a home, but it doesn’t hurt to be acquire some knowledge of the process prior to seeing your lawyer. We will share with you some of the more important and relevant sections of the agreement, and from here you will be more equipped when the time comes for you to sign one.The Agreement of Purchase and Sale is a standard contract governed by AREA the Alberta Real Estate Association. The purchase or sale for a home is usually the largest transaction that you will make in your lifetime. As such, the Agreement should be fully understood by both the buyer and seller and requires that both parties fully understand what it contains and what it means to them.The agreement is only a few pages when you remove the signature page and schedules that contain additional provisions. It contains many self-explanatory “fill in the blank” provisions, but care must be taken to ensure that they are accurately completed, including the names of the parties, the purchase price, the property description, the deposit and the closing date. The date of the agreement is typically for reference purposes only.Here we list some of the more important sections of the agreement. 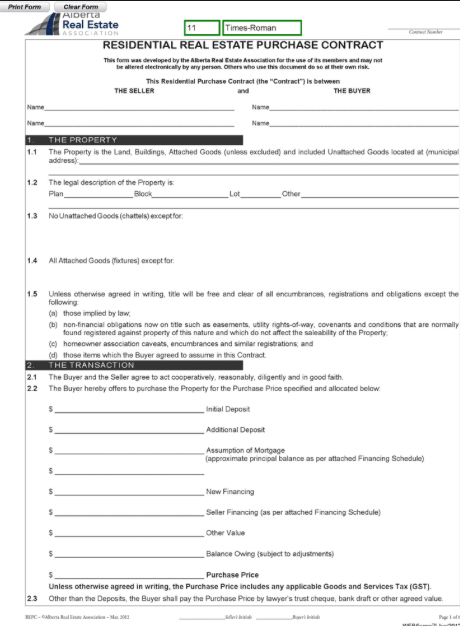 The Property – this section provides the legal address and description of the property being sold/purchased. It also details any items or “chattels” that are to be included or excluded from the agreement. The Transaction section is important because it details the financials’ what the initial deposit is, an assumption of mortgage, financing and any other details that are. The Deposit section details where any monies and deposits will be held in trust, legal details pertaining to the financial transaction and all other financial conditions included on the agreement. The Conditions section details all conditions that are part of the offer. A condition could be based on approved financing, passing a home inspection or and other condition the buyer chooses to implement. Once the Offer is made by one party and accepted by the other, it becomes a binding agreement of purchase and sale (subject to any conditions set out therein). In order to get the Agreement right, the buyers and sellers will have to heavily rely on the expertise of their realtors and lawyers, but should make every effort to read and understand the Agreement provisions before rushing off to sign.It is fair to say that some real estate transactions are more complicated than others. Therefore ensuring you have a licensed realtor and legal professional on your team is imperative for a smooth and easy transaction. Are you looking to Sell or Buy a home in Calgary, contact Ross today.